The Google Nexus 7 (2013) was launched in the USA in July 2013, but hasn't been made available in many other markets yet. 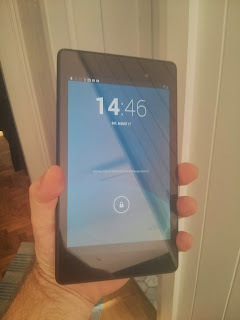 I broke my original Nexus 7 (from 2012) so was keen to replace it with the new model. A mail order purchase of $269 (32 GB WiFi) from Walmart plus USD$45 shipping from a USA mailing address and a week later I received it here in Sydney, Australia. The body isn't as wide, so it's easier to hold in one hand. It has Android 4.3 - the latest operating system at the time of writing. Little else of consequence has changed - even the annoying fact that the micro-USB socket is 180 degrees to the socket on the Nexus 4. Why is this annoying? I have a bedside dock that works really well with both devices, but I have to rotate the plug before swapping devices. One other minor feature is that is has a flashing indicator light like other members of the Nexus family and Blackberry. Quite handy and something the iPhone & iPad families could benefit from. The only issue I have encountered is one that is already circulating the internet - the touch screen can be a little over-sensitive at times. It's sporadic and not a problem - at least at the moment. I'm glad I purchased it. It's more portable than my iPad 3 (which still gets a good workout from me - I have some business-related use cases for it), and it does a bunch of things my Nexus 4 can't. The screen really is outstanding, and putting side-by-side with an iPad Mini makes you realise just how badly Apple needs to upgrade that screen.